This article is about the biological term. For the medical condition in humans, see Albinism in humans. "Albino" redirects here. For other uses, see Albino (disambiguation). Albinism is the "congenital absence of any pigmentation or coloration in a person, animal or plant, resulting in white hair, feathers, scales and skin and pink eyes in mammals, birds, reptiles, amphibians and fish and other small invertebrates as well." Varied use and interpretation of the terms mean that written reports of albinistic animals can be difficult to verify. 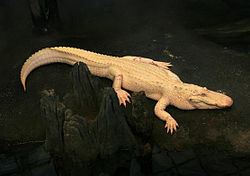 Albinism can reduce the survivability of an animal; for example, it has been suggested that albino alligators have an average survival span of only 24 hours due to the lack of protection from UV and their lack of camouflage to avoid predators. 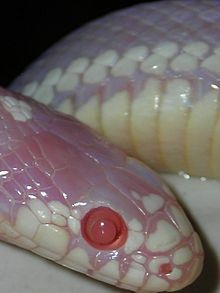 Albino animals have characteristic pink or red eyes because the lack of pigment in the iris allows the blood vessels of the retina to be visible. 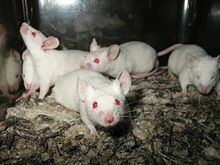 Familiar albino animals include in-bred strains of laboratory animals (rats, mice, guinea-pigs and rabbits), but populations of naturally occurring albino animals exist in the wild, e.g. Mexican cave tetra. Albinism is a well-recognized phenomenon in molluscs, both in the shell and in the soft parts. It has been claimed by some, e.g. that "albinism" can occur for a number of reasons aside from inheritance, including genetic mutations, diet, living conditions, age, disease, or injury. However, this is contrary to definitions where the condition is inherited. Animals can appear colored due to two mechanisms, pigments and structural colors. Animals may have both biological pigments and structural colors, for example, some butterflies with white wings. One definition states that "albinism, (from the Latin albus, meaning "white"), hereditary condition characterized by the absence of pigment in the eyes, skin, hair, scales, or feathers", however, this does not encompass invertebrates, nor does it include plants. Furthermore, it could be interpreted that "...absence of pigment..." does not include an absence of structural colours. The lack of clarity about the term is furthered when the name of an animal includes the term "albino" although the animals (clearly) do not have the condition. For example, the albino gaur has this name because it is ash-grey whereas other gaur are almost black. Albinism occurs throughout the animal kingdom. The condition is most commonly seen in birds, reptiles and amphibians, but more rarely seen in mammals and other taxa. It is often difficult to explain occasional occurrences, especially when only one documented incidence has occurred, such as only one albino gorilla and one albino koala. In mammals, albinism occurs once in every 10,000 births, but in birds, the rate is once in every 1,764 births. Albinism was observed in jungle cats (Felis chaus) and jackals (Canis aureus) along the coastline of the southern Western Ghats (Kerala and Kanyakumari coast, India). Albinism was observed in jungle cats from the Amaravila area of Trivandrum district in the Kerala State. Albinism in jackals was observed from the Polooni area in Malappuram district and Chaliyam area of Calicut district (Kerala). As albinism is observed in those areas where the density of these mammals is comparatively low, it is concluded that continuous inbreeding could be the reason for expression of albinism. Albinism can also occur in marsupials and monotremes as well such as echidnas, kangaroos, koalas, possums, wallabies and wombats as well. Albino dolphins were first sighted in the Gulf of Mexico in 1962. Since 1994, three further individuals have been seen. These tend to be pink in color due to blood vessels showing through the blubber and unpigmented skin. A report published in 2008 stated that in marine mammals, "anomalously white" individuals have been reported for 21 cetacean species and 7 pinniped species but there were no known reports of anomalously white sea otters (Enhydra lutris) or sirenians. An albino bird has a white beak, white plumage, non-coloured skin, white talons and pink or red eyes. Albinism is only seen in about 1 of every 1,800 birds. The two most common species of albino birds are the common house martin and the American robin. Famous albino birds include "Snowdrop", a Bristol Zoo penguin. Total albinism – a simultaneous complete absence of melanin from the eyes, skin, and feathers. This is the rarest form. Only 7% of 1,847 cases of avian albinism examined was this type. Incomplete albinism – when melanin is not simultaneously absent from the eyes, skin and feathers. Imperfect albinism – when melanin is reduced in the eyes, skin and feathers. Partial albinism – when albinism is localized to certain areas of the body. Several types of aquarium fish are have "albino" in their names, e.g. albino driftwood catfish, albino festivum, albino red tailed shark, and albino tiger shark, however, photographs of these four fish indicate that the latter three have dark eyes and/or pigmented fins. Zebrafish have three types of chromatophores—iridophores, melanophores, and xanthophores—which produce silver, black, and yellow pigmentation respectively. Zebrafish that lack iridophores are known as roy mutants, those that lack melanophores as albino mutants, and those which lack both melanophores and iridophores are ruby mutants. The gross eye morphology, feeding and swimming behaviours between wild-type and albino zebrafish were indistinguishable, except under dim or bright light or low contrast. In mammals, albinism is occasionally associated with hearing impairments. However, when tested, there was no differences in responses between wild-type and albinistic European wels catfish (Silurus glanis) and South American bronze catfish (Corydoras aeneus). Similarly, Mexican blind cave fish (Astyanax mexicanus) do not differ in hearing sensitivity from the normally pigmented and eyed surface-dwelling populations. Fish lack melanin in the inner ear, meaning that hearing in fishes is less likely to be affected by albinism than in mammals. In the wild, albinism is reasonably common in the teleosts, especially the Pleuronectiformes (flatfish), however, it is rarely reported in the elasmobranchs. Albinism has been reported in hagfish, lampreys, sharks, rays and numerous teleost fishes, e.g. catfishes, grunts or cyprinids. There are three known "albino" strains of leopard gecko, however, breeders state that albinos are generally recognized by their lack of black pigment and having red eyes is not a requirement to be considered an albino. These three strains are called "tremper albinos", "rainwater albinos" and "bell albinos". "Depigmented" arthropods have been found, usually in cave populations. "Albino" individuals of normally red citrus red mites (Panonychus citri) occasionally appear in laboratory colonies, however, these still contain green and yellow pigments. This albinism does not affect mortality. Melanism is the direct opposite of albinism. An unusually high level of melanin pigmentation (and sometimes absence of other types of pigment in species that have more than one) results in an appearance darker than non-melanistic specimens from the same gene pool. ^ a b "Albinism". The Free Dictionary. Retrieved January 31, 2015. ^ "New Albino Alligators". GeorgiaAquarium.org. The Georgia Aquarium. Archived from the original on January 20, 2015. Retrieved January 20, 2015. ^ McCardle, H. "Albinism in wild vertebrates". Texas State University. Retrieved January 24, 2015. ^ a b Kumari, M.; Clarke, H. J.; Small, I.; Siddique, K. H. M. (2009). "Albinism in plants: A major bottleneck in wide hybridization, androgenesis and doubled haploid culture". Critical Reviews in Plant Sciences. 28 (6): 393–409. doi:10.1080/07352680903133252. ^ a b "Albiflora". Archived from the original on February 2, 2015. Retrieved January 28, 2015. ^ Mäthger, L. M.; Denton, E. J.; Marshall, N. J.; Hanlon, R. T. (2009). "Mechanisms and behavioural functions of structural coloration in cephalopods". Journal of the Royal Society Interface. 6: 149–163. doi:10.1098/rsif.2008.0366.focus. PMC 2706477. PMID 19091688. ^ Taylor, J. D. (1969). "The effects of intermedin on the ultrastructure of amphibian iridophores". General and Comparative Endocrinology. 12 (3): 405–16. doi:10.1016/0016-6480(69)90157-9. PMID 5769930. ^ "Albino". Retrieved January 31, 2015. ^ "Albino". Cambridge Dictionaries On-line. Retrieved January 31, 2015. ^ "Albino". Dictionary.Reference.com. Retrieved January 31, 2015. ^ "Albinism". Merriam-Webster. Retrieved January 31, 2015. ^ a b "Leucisam and albinism". BTO.org. British Trust for Ornithology. Retrieved January 31, 2015. ^ a b c de Grouw, H. (2006). "Not every white bird is an albino: Sense and nonsense about colour aberrations in birds" (PDF). Dutch Birding. 28: 79–89. ^ "Albinism". Encyclopædia Britannica. Retrieved January 27, 2015. ^ a b c d Binkley, S. K. "Color on, color off" (PDF). Retrieved January 22, 2015. ^ a b c d "Albino animals". Wonders of the Nature. Archived from the original on January 28, 2015. Retrieved January 24, 2015. ^ a b Nasr, S. R. (July 15, 2008). "How albinism works". HowStuffWorks.com. Retrieved January 23, 2015. ^ "Albinism in animals". Science Illustrated. 2011. Retrieved January 24, 2015. ^ Allison, W. T.; Hallows, T. E.; Johnson, T.; Hawryshyn, C.W. ; Allen, D. M. (2006). "Photic history modifies susceptibility to retinal damage in albino trout". Visual Neuroscience. 23 (1): 25–34. doi:10.1017/s0952523806231031. PMID 16597348. ^ a b c Esteve, J. V.; Jeffery, G. (1998). "Reduced retinal deficits in an albino mammal with a cone rich retina: A study of the ganglion cell layer at the area centralis of pigmented and albino grey squirrels". Vision Research. 38 (6): 937–940. doi:10.1016/s0042-6989(97)00229-0. PMID 9624442. ^ Dobosz, ByS; Kohlmann, K.; Goryczko, K.; Kuzminski, H. (July 2008). "Growth and vitality in yellow forms of rainbow trout". Journal of Applied Ichthyology. 16 (3): 117–20. doi:10.1046/j.1439-0426.2000.00147.x. ^ Menzel, R. W. (1958). "Further notes on the albino catfish". Journal of Heredity. 49 (6): 284–293. doi:10.1093/oxfordjournals.jhered.a106828. ^ a b c d Purdom, C. F., ed. (1993). Genetics and Fish Breeding. London: Chapman and Hall. ISBN 978-0-412-33040-7. Retrieved February 2, 2015. ^ a b c Lechner, W.; Ladich, F. (1987). "How do albino fish hear?". Journal of Zoology. 283 (3): 186–192. doi:10.1111/j.1469-7998.2010.00762.x. PMC 3083522. PMID 21552308. ^ a b Halls, K. M. (2004). Albino Animals. Minneapolis: Lerner Publishing Group. ISBN 978-1-58196-019-8. ^ Creel, D. (June 1980). 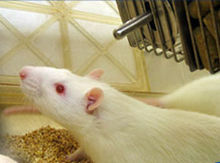 "Inappropriate use of albino animals as models in research". Pharmacology Biochemistry and Behavior. 12 (6): 969–7. doi:10.1016/0091-3057(80)90461-X. PMID 7403210. ^ a b Mahabal, Anil; Rane, P. D.; Pati, S. K. (2012). "A case of total albinism in the Bonnet Macaque Macaca radiata (Geoffroy) from Goa" (PDF). Zoos' Print Journal. 27 (12): 22. ^ Sanil, R.; Shameer, T. T.; Easa P.S. (2014). "Albinism in jungle cat and jackal along the coastline of the southern Western Ghats". Cat News. 61: 23–25. ^ Dewsbury, D. A.; Ward, S. E. (1985). "Effects of albinism on copulatory behavior and sperm competition in prairie voles (Microtus ochrogaster)". Bulletin of the Psychonomic Society. 23 (1): 68–70. doi:10.3758/bf03329782. ^ a b c Fertl, D.; Rosel, P. E. (2008). "Albinism". In Perrin, William F.; Würsig, Bernd; Thewissen, J. G. M. (eds.). Encyclopaedia of Marine Mammals (2nd ed.). Amsterdam: Elsevier. pp. 22–24. ISBN 978-0-12-373553-9. ^ "Rare Pink Dolphin Seen in Louisiana Lake". Fox News Channel. July 3, 2007. Archived from the original on February 24, 2010. Retrieved February 27, 2010. ^ "Albino dolphin in northern Gulf of Mexico" (PDF). NOAA. Retrieved January 30, 2015. ^ Alaja, P.; Mikkola, H. "Albinism in the Great Gray Owl (Strix nebulosa) and Other Owls" (PDF). Retrieved January 24, 2015. ^ "List of aquarium fish species by name". Retrieved February 2, 2015. ^ Ren, J. Q.; McCarthy, W. R.; Zhang, H.; Adolphc, A. R.; Lia, L. (2002). "Behavioral visual responses of wild-type and hypopigmented zebrafish". Vision Research. 42 (3): 293–299. doi:10.1016/S0042-6989(01)00284-X. PMID 11809482. ^ Leal, M. E.; et al. (2013). "First record of partial albinism in two catfish species of Genidens (Siluriformes: Ariidae) in an estuary of Southern Brazil". Brazilian Archives of Biology and Technology. 56 (2): 237–240. doi:10.1590/S1516-89132013000200008. ^ de Brito, Marcelo F. G.; Caramaschi, Érica P. (2005). "An albino armored catfish Schizolecis guntheri (Siluriformes: Loricariidae) from an Atlantic Forest coastal basin". Neotropical Ichthyology. 3 (1): 123–125. doi:10.1590/S1679-62252005000100009. ^ Nakaya, K. (1973). "Albino zebra shark from the Indian ocean with comments on albinism in elasmobranchs" (PDF). Japanese Journal of Ichthyology. 20 (2): 120–122. ^ Bondari, K. (1984). "Comparative performance of albino and normally pigmented channel catfish in tanks, cages, and ponds". Aquaculture. 37 (4): 293–301. doi:10.1016/0044-8486(84)90295-3. ^ Protas, Meredith E; Hersey, Candace; Kochanek, Dawn; Zhou, Yi; Wilkens, Horst; Jeffery, William R; Zon, Leonard I; Borowsky, Richard; Tabin, Clifford J (2006). "Genetic analysis of cavefish reveals molecular convergence in the evolution of albinism". Nature Genetics. 38 (1): 107–111. doi:10.1038/ng1700. PMID 16341223. ^ Reum, J. C. P.; Paulsen, C. E.; Pietsch, T. W.; Parker-Stetter, S. L. (2008). "First record of an albino Chimaeriforme fish" (PDF). Northwestern Naturalist. 9: 60–62. doi:10.1898/1051-1733(2008)89[60:FROAAC]2.0.CO;2. ^ Martin, R. A. "Albinism in sharks". ReefQuest Centre for Shark Research. Retrieved February 2, 2015. ^ a b Sandoval-Castillo, J.; Mariano-Melendez, E.; Villavicencio-Garayzar, C. (2006). "New records of albinism in two elasmobranchs: The tiger shark Galeocerdo cuvier and the giant electric ray Narcine entemedor". Cybium. 30 (2): 191–192. Retrieved February 2, 2015. ^ Hubbard, G. B.; Fletcher, K. C. (1985). "A seminoma and a leiomyosarcoma in an albino African lungfish (Protopterus dolloi)". Journal of Wildlife Diseases. 21 (1): 72–74. doi:10.7589/0090-3558-21.1.72. PMID 3981753. ^ "White alligator is one of rarest in world". February 16, 2009. Retrieved September 19, 2018 – via www.telegraph.co.uk. ^ "Albino crocodile that killed a fisherman shot dead near Darwin – video". The Guardian. August 20, 2014. Retrieved August 11, 2015. ^ "Albino anole". 2012. Retrieved March 8, 2012. ^ "Rare albino lizard found in backyard". Australian Broadcasting Corporation. 2007. Retrieved March 8, 2015. ^ Sage, P. (2006). "Guide to Leopard Gecko Morphs and Genetics". Retrieved March 8, 2015. ^ a b Modesti, A.; Aguzzi, S.; Manenti, R. (2011). "A case of complete albinism in Lissotriton vulgaris meridionalis" (PDF). Herpetology Notes. 4: 395–396. ^ Taylor, John William (1900). Monograph of the Land & Freshwater Mollusca of the British Isles. 1. Taylor Brothers. p. 92. ^ Taylor, John William (1900). Monograph of the Land & Freshwater Mollusca of the British Isles. 1. Taylor Brothers. p. 90. ^ Hoste, B.; Simpson, S. J.; Tanaka, S.; De Loof, A.; Breuer, M. (2002). "A comparison of phase-related shifts in behavior and morphometrics of an albino strain, deficient in [His7]-corazonin, and a normally colored Locusta migratoria strain". Journal of Insect Physiology. 48 (8): 791–801. doi:10.1016/s0022-1910(02)00106-3. PMID 12770057. ^ Service, Elizabeth. Fruit Fly Phenotypes. unc.edu. ^ a b Zhao, H.; Chen, M.; Yang, H. (2015). "Albinism". In Yang, Hongsheng; Hamel, Jean-Francois; Mercier, Annie (eds.). The Sea Cucumber Apostichopus japonicus: History, Biology and Aquaculture. Academic Press. pp. 211–226. ISBN 978-0-12-799953-1. ^ Locket, N. A. (1986). "Albinism and eye structure in an Australian scorpion, Urodacus yaschenkoi (Scorpiones, Scorpionidae)". Journal of Arachnology. 14 (1): 101–115. JSTOR 3705557. ^ Wilkes, J. T. (1963). "A recessive albinism in the citrus red mite". Annals of the Entomological Society of America. 56 (6): 792–795. doi:10.1093/aesa/56.6.792. ^ "Amphibian Biology & Physiology: Caudata" at Amphibian Information Resource: An Educational Web Project About Amphibian Species; sourced December 2006, actual authoring/publication date unspecified. ^ "Feather Colors: What We See" Archived March 28, 2009, at the Wayback Machine by Dr. Julie Feinstein of the American Museum of Natural History (NY), in Birder's World Magazine online archive; sourced December 2006, actual authoring/publication date unspecified. ^ Stienstra, T. (October 11, 2007). "It's no snow job – handful of redwoods are rare albinos". San Francisco Chronicle. Retrieved December 6, 2010. ^ a b Krieger, L. M. (November 28, 2010). "Albino redwoods hold scientific mystery". San Jose Mercury News. Retrieved November 23, 2012. ^ "A Creepy Monster of the Forest: The Albino, Vampiric Redwood Tree". Blogs.DiscoverMagazine.com. December 8, 2010. Retrieved November 23, 2012. ^ Kerr, E. A. (1963). "Inheritance of crinkle, variegation, and albinism in sweet cherry". Canadian Journal of Botany. 41 (10): 1395–1404. doi:10.1139/b63-122. ^ a b "10 Most Incredible Albino Animals on Earth". Scribol. Retrieved January 20, 2015.